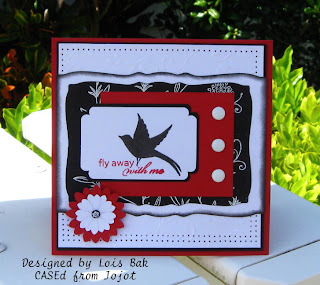 The Featured Stamper on SCS this week is my fellow Stampin'B's Design Team buddy, so you know I'd be CASEing several of her cards today. I actually made four cards! The first one I chose is shown on the computer screen next to my version. The next card I chose is this one, using the Split Negative technique. Another favorite color combination of Joanne's is red, black, and white. I used this card as the starting point of my third card. Note, too, that I did not use the corner punch she used on her card. I used the scallop corner punch (dimple) that I now own because of Joanne. Don't look too closely at the CB background embossing. After I was finished, I noticed that the birds are up-side down. Oops! My final card was a Halloween card. Between my sister and me, we make about 90 Halloween cards for the residents of the assisted living facility where my mom lives. I used this card of Joanne's as the starting point. 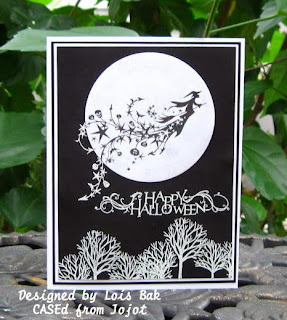 I cut the moon out with a round Nestabilities die and stippled it with a little bit of black ink. I usually do maybe one or two cards for the Featured Stampers challenge, but I went overboard this week. And, believe me, it was not hard at all. You should check out her gallery. It's amazing! Now that my Mom's birthday party is over and my sister has gone home, I have time to get back to stamping. 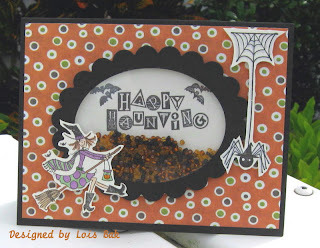 NancyRuth was the hostess for this week's Stampin'B's Design Team challenge. She wanted us to use chalks on our card. First, I must say I’m not very proficient with chalks; but I was willing to give it a shot. 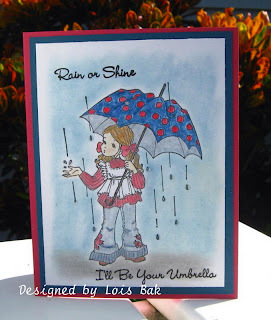 I stamped the Umbrella Girl from Whiff of Joy stamps on white cardstock and colored her with Stampin’ Up!’s pastel chalks, using a blender pen. The background is done with Pebbles pearlescent chalks, using a small cotton ball. You probably can’t see it well, but all the rain drops have little globs of Crystal Effects to make them shine. IRL it is much more noticeable. The sentiments are from My Favorite Things. The Rose Red and Not Quite Navy cardstock matting finished it off. NancyRuth, thank you for making me step outside my comfort box with this challenge. That’s what I like about this group of stampers – we make each other work but are supportive all the time!!! The Whiff of Joy Umbrella Girl can be found at Creative Design Boutique. No cards today, but I wanted to share my mom's 90th birthday celebration with you. She lives in an assisted living facility, and we all gathered in the library to celebrate. This is a photo of my mom -- with me (in the white top), my sister Dotsy and my brother Bob. Dotsy flew in from Illinois, and Bob flew in from Pennsylvania. This is a photo of my mom's grandchildren who attended. The two guys are my sons Doug and Scott. My niece Laura is in red, and my daughter Kathi is in blue. Scott is the only one who had to come from out-of-state. He lives in Alabama. Unfortunately, his children have already started school, so Scott's wife Bonnie and three children could not attend. In addition, my sister's son was not there. He lives in Illinois with his family. My brother's son lives in Pennsylvania, with his wife and two boys. They, also, could not attend. This picture is of some of my mom's great-grandchildren. There are two more who live in Pennsylvania, one in North Carolina, two in Illinois, one here in Florida, and three in Alabama. 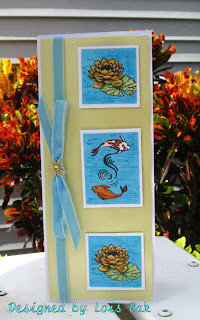 Faith (Markie's Mom) was our hostess this week, and her challenge was to use two different die-cuts on our card. 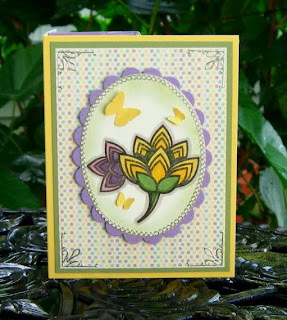 Her challenge gave me the opportunity to use two brand-new (to me) Spellbinders dies that just arrived in the mail. The dragonfly is cut from some pearlescent yellow paper and sponged with Bashful Blue and Old Olive before I removed the die. The frame was cut from Creamy Caramel and sponged with Close to Cocoa. Then I had to decide what to put INTO the frame. I stippled some Summer Sun and Really Rust around the outside of a piece of Very Vanilla cardstock and then stamped the Queen Anne’s Lace in Chocolate Chip. I stamped the Happy Birthday on a scrap of the pearlescent yellow paper with Chocolate Chip, punched out the circle, and matted it with Chocolate Chip. Everything is popped up on dimensionals, with the exception of the background – Chocolate Chip and Basic Grey Porcelain DP. 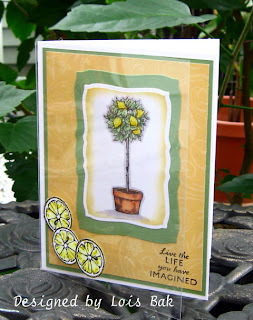 I decided to do a second card for this challenge, using one of the new stamps I received from Creative Design Boutique. In addition, I wanted to try out a new tool I recently purchased at the CHA Super Show -- The Ultimate Crafters Companion -- which has all types of score lines and templates. I stamped and masked two of the stamps from Funky Florals by Rita Marie and Company onto white cardstock and colored with Prismacolor and Copic markers. For a little shimmer, I went over all the coloring with a clear Sakura Stardust gel pen. After sponging around the oval die-cut, I sponged Mellow Moss around the edge and added a peel-and-stick silver strip. I mounted the oval on a scalloped oval in Lavendar Lace. The card base is So Saffron, matted in Mellow Moss; and the background paper is Micro Dots DP from Rita Marie and Company. 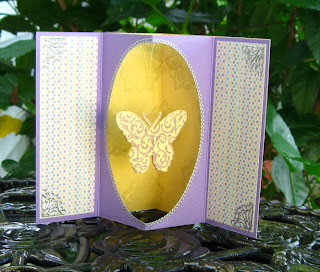 I added a few silver corner embellishments and the three punched butterflies. The inside, however, is where I used the cool Crafter' Companion. 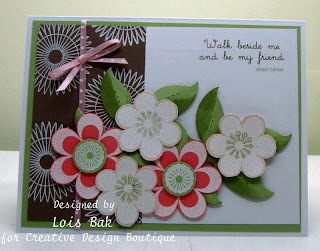 I stamped another one of the flowers from Funky Florals on the inside of the card. Then I cut another piece of Lavendar Lace and scored it for a gatefold card on the scorelines, which are labeled for a gatefold card. I cut out the center oval on the template section. The butterfly, cut from a two-part Cuttlebug die-cut/embossing folder set, is strung on fishing line and taped to the inside of the oval cut-out piece. I glued down two pieces of the same DP on outside sections, added some more silver corners, and glued it down on the card base. Voila, with just a little bit of extra work, you get a clever result! 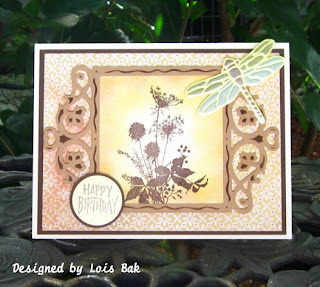 Images and paper on this card may be found at Creative Design Boutique. Today's Featured Stamper on SCS is one of my favorite stampers -- Sleepyinseattle, whose real first name is Joanne. I've admired her work for a long, long time. It was difficult to pick only one card to CASE, but I finally chose this card, which she called Pictures. I kept her colors and sketch, although I did make the center square into a rectangle. The other things I changed were: made a long card, added a ribbon and brad, and used different stamps. I stamped the images with Versafine Black Onyx and embossed with clear embossing powder, then colored them with Prismacolor and Copic markers. I had to make the center "square" a "rectangle" to enable me to use those koi fish. I added the velvet ribbon and used a glue dot to place the fancy brad on the knot. Congrats to you, Joanne. You deserve the honor! 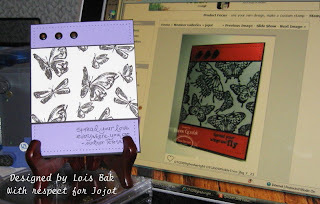 Joanne (jojot) was our hostess for this week's Stampin'B's Design Team Blog Challenge. 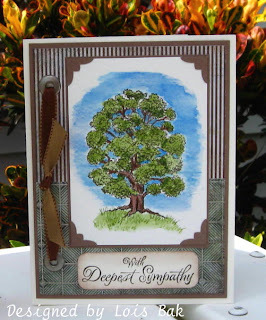 Sympathy cards are always difficult for me, and masculine ones are harder yet. Joanne’s challenge, therefore, was a double header! I also wanted to try some watercoloring, which is not one of my strengths. I stamped this wonderful, sturdy oak tree by Rubber Stampede onto watercolor paper and colored it with markers and a water brush. The card base of Very Vanilla is matted with Close to Cocoa. The two pieces of DP are from Basic Grey’s Archaic pad, which I really like on masculine cards – what with all the greens and browns in it. The small photo corners were punched using an EK Success punch. I added a couple of jumbo eyelets and some brown not-so-feminine ribbon, tied in a knot. P.S. I attached the sentiment with repositionable glue because I intend to remove it and replace it with a Happy Birthday sentiment so I can send it to my son. Does that make me a lazy mother -- that I didn’t want to make a completely different card? I hope not! We have a winner of our first Creative Designs Boutique Blog Hop. Faith's son Markie chose the lucky lady -- LINDA STEVENS! Congratulations to you, Linda!!! Hope you enjoy your goodies. Please email: mjh7433109@aol.com with your address so that we can get your prize to you! Thanks to everyone who participated in our first go round, and we hope you'll stop by again. We will be having a blog hop on the first Wednesday of each month. The next date is September 2nd, so put it on your calendar! 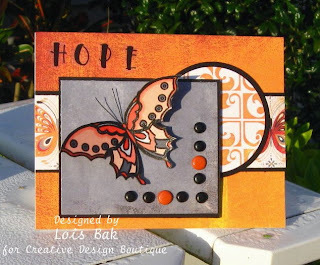 Both my Sketch and Color challenges on SCS this week were made using Rita Marie & Company stamps. For today's sketch challenge, I used a set called Flutterby Delight and lots of Basic Grey DP. I stamped the butterfly on a pale piece of DP from the Basic Grey Ambrosia DP pad and colored it with Copic and Prismacolor markers. All the rest of the DP is also from the same paper pad. The sentiment is composed of individual letter stickers. I added some brads for interest. Yesterday's color challenge had lots of colors -- and I used them all. The larger flowers were stamped on Cameo Coral; the smaller flowers on Blush Blossom - all with Whisper White and embossed. The side panel was created by stamping the lined image with Whisper White onto Close to Cocoa and embossed with white ep. The Sizzix leaves were cut from Certainly Celery; the sentiment is a rub-on. Are you ready to see some new stamps? It's time for Creative Design Boutique's Blog Hop, and all six members of the team are excited to bring you some goodies! And, there's BLOG CANDY!!! Butterflies are some of my favorite images. This set, Flutterby Delight by Rita Marie and Company, has three butterflies, some flowers and several “bugs” that are all lots of fun! 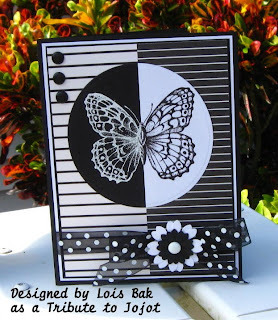 For my card I stamped one of the butterflies and the caterpillar, using Versafine Black Onyx, embossed with clear embossing powder. 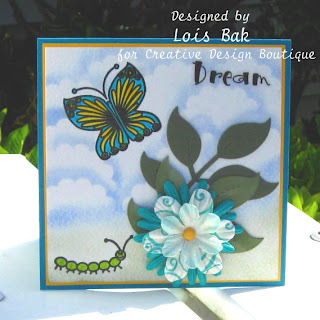 After masking the butterfly and caterpillar with images stamped on Post-It notes, I sponged the clouds using a scallop circle and a sponge dauber. I then colored them with Twinkling H2Os so that they shimmer. 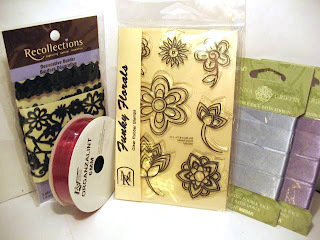 I cut the leaves from a Sizzix die and added the primas and brad. I figured the caterpillar dreamed of being a butterfly one day – thus the sentiment, which I put on using sticker letters. Make sure you visit ALL of the blogs of the Creative Boutique design team, leave comments on ALL 6 of the Blog Posts; and a winner's name will be chosen from those posts on Thursday, August 6, and posted at 6 PM. You have to leave a comment on each blog to be eligible to win. Here are the links for the rest of the team! Good Luck! * Stamps - Flutterby Delight by Rita Marie & Co.